If only every research project every conducted would publish their results in the organized and open format that Stanford has with their famous Stanford Study of Writing, which can be found here. All their methodological materials are available, for those who might wish to reproduce the study, and their background, methods, and research question are summarized in short, two-paragraph sections: Brilliant. Imagine what the field of (college) writing/composition would be if every major institution conducted the same study, maintained the same database–the knowledge accumulated would be fantastic. Here’s a cheers to rigorous, longitudinal methods of research. Perhaps, if we can conduct more studies such as Stanford’s, which continue to investigate the multifaceted dynamics of writing, theories of composition might be generated which could in tern be applied to other disciplines’ generation and arrangement of knowledge, the way that Bruno Latour, and new media theorists’ have. 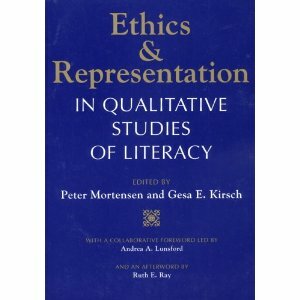 Although published in 1996, Ethics and Representation in Qualitative Studies of Literacy offers an excellent array of discussion on the classic qualitative methods issues, from seminal voices such as Patricia A. Sullivan and Lucille Parkinson McCarthy. Perhaps one of the most applicable chapters for my own future research was Blakeslee, Cole and Conefrey’s piece on negotiating subjective perspectives within ethnographic research (chapter 8), particularly when studying a community whose epistemological assumptions are foundationally different than the researcher’s. They used Blakeslee’s own experience researching physicists as a case study, particularly considering authority, scientific epistemology and how a text can be negotiated to ethically reflect the perspective of both the subject and the theories of the critic/observer. Like Sullivan (and Porter), the authors of this chapter acknowledge the fact that ethnographers can be neither fully authoritative, nor fully objective in analyzing their observations, but must acknowledge their subjective perspective and rely on others to produce an ethical, textual representation. My own study of the medical community will draw from these concepts. This entry was posted in ENC 6720 Qualitiative Methods, Higher Education and tagged Bruno Latour, Compositionism, Ethics, Qualitiative Research, Research Methods, Stanford Study of Writing.